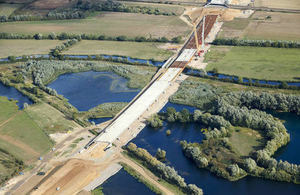 750m River Great Ouse viaduct bridge, A14 Cambridge to Huntingdon improvement road scheme. Parts of these bridges were developed in a factory, meaning they were built more efficiently than if traditional methods of construction had been used. A massive £600 billion investment in our roads, hospitals and schools over the next ten years has been set out today, alongside proposals to harness modern technologies to build infrastructure in the most effective way. The Government’s National Infrastructure and Construction Pipeline reveals the vast scale of public and private investment underway and expected by 2028. It includes schemes announced by Chancellor Philip Hammond in his recent Budget, like the £28 billion national roads fund, as well as other flagship projects like East West Rail, upgrading the M6 to a smart motorway and Hornsea Project One – the largest offshore wind farm in the world. To ensure maximum efficiency in building these projects ministers are encouraging greater use of more modern approaches to construction. This includes the manufacturing of components in factories using the latest digital technology before being sent for assembly on construction sites. The Government has committed to increasing use of these methods in public-funded projects and today asks for views on how to encourage greater use of these cutting-edge techniques.